I’m a big fan of paper and stationary. I mean, I designed my own planner for crying out loud. 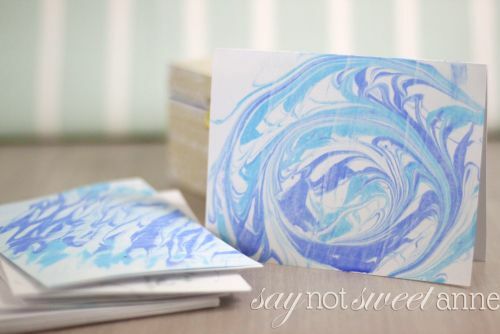 So, while it is true this project could be a gift… I’ll skip the formalities and admit I made the DIY Marbled Paper Stationary for myself. I’m not even ashamed. I can’t wait to use it! 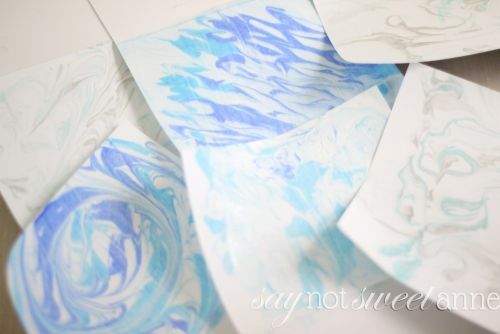 There are a bunch of ways of making marbled patterns on paper, and I’ve tried a fair amount of them. I have to say though, this one is my absolute favorite. I LOVE that I can use my favorite paints, and that even the metallic paints come through. I love how easy it is, and that it doesn’t soak my paper and make it all wrinkly. I also love the price point and all of the amazing possibilities. 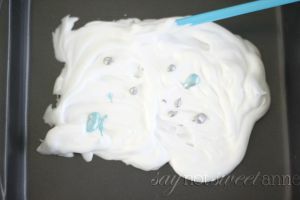 Shaving Cream – The fluffy kind, not gel. And make sure its a scent you like – bonus scented stationary! Start by adding a bunch of the shaving cream to the bottom of your pan. 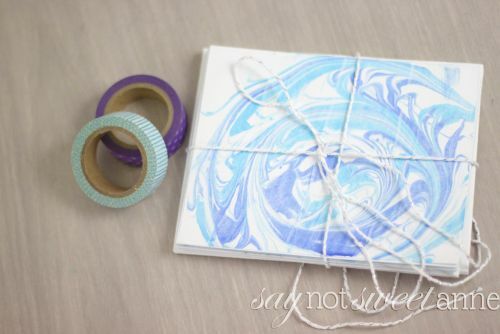 Smooth it out with the back of a spoon so there is enough to cover your note cards. Add a couple of drops of your favorite paint. I like to water mine down a bit so it spreads better. 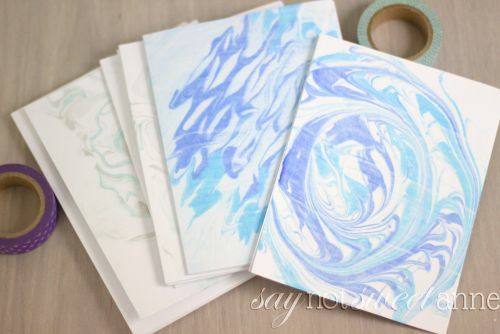 Using a straw, a pencil or other interesting items (a to pronged BBQ fork) swirl around the paint until you get a great pattern. 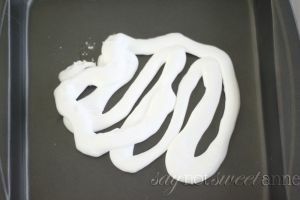 Place your notecard face down into the shaving cream and then gently lift up. Use the credit card to scrape the extra shaving cream off the card. Add it back into your pan and keep going! 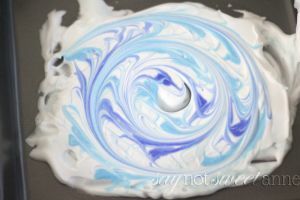 As you continue to re-use the shaving cream your patterns will become more and more saturated with color. That’s OK! Try introducing new colors half way through. 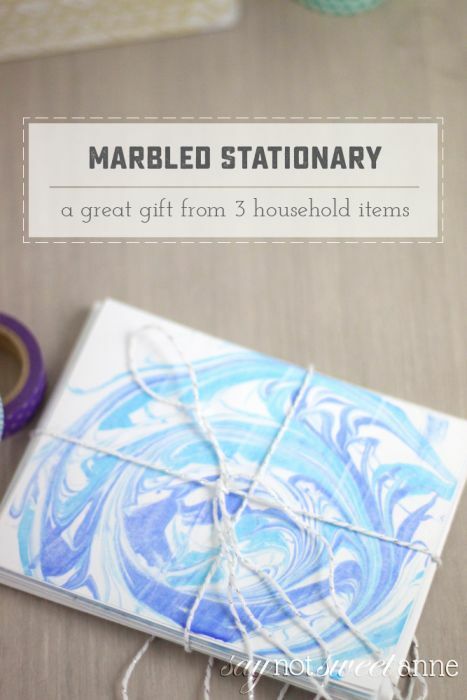 Its your stationary set – make it unique! 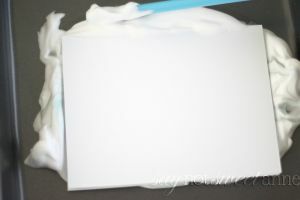 Let the cards dry, and then flatten them by sitting over night under some heavy books, or my ironing them with a low iron until crisp. A bit of twine and some coordinating washi tape completes the gift set!